Liturgy comes from a word meaning "public work"; by its performance more is expressed than can be conveyed in verbal formulae. Like music, liturgy holds more than can be explained in a commentary. The meaning is implicit and conveyed by performance. It is not a theatrical performance but more like the performance of a string quartet, not in its aesthetics, but in the thing behind the music. Classical music's anti-silly conventions lobby has been getting quite a bit of airtime here recently, so I offer the thoughts above to add some balance. They come from Christopher Howse's book Sacred Mysteries and help explain why concert hall conventions have survived and also clarify the intentions, if not the actions, of traditionalist Catholics. 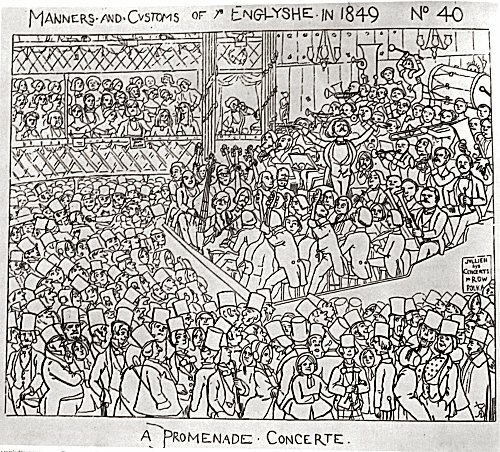 Illustration shows Julien's Orchestra at a Promenade Concert in Covent Garden. Louis Antoine Jullien (1812-1860) was born in Sisteron in France and after leaving France to escape his creditors established promenade concerts in London; which means that great British tradition the last night of the Proms is in fact of pure French descent. 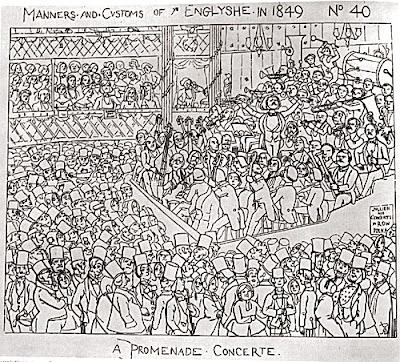 Jullien's first concerts were popular mixed programmes but later introduced symphonies, a trend which which contemporary Promenade Concerts have reversed. There is a topical link to audience interruptions at Promenade Concerts here, and more on music as ritual here. I wonder if you have read "Musicking" by Christopher Small? Here you can find a devastatingly thorough analysis of the conventions of the concert hall. The problem with a lot of these conventions is that they are upheld by people who imagine them to be respectful, correct, intelligentally informed etc but are often arbitrary or wrongheaded. The mania for early music authenticity (or authenticity full stop) is another symptom of this lack of historicity. Period performance is good because it sounds good in itself, not cos that's what Bach wanted. To people who get sniffy about Bach on the piano, I want to say to them: "Ok, go to your Bach recital, but turn up in a horse and cart (as Arcadi Voldos suggested); bring a stick for the conductor to bang the floor with, clap between movements; talk throughout; and walk out half-way through (cf. performance of Goldberg Variations told in Rosen's 'Piano Notes' in which one person was left by the end).